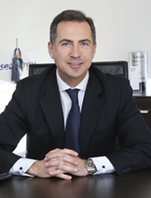 Stamatis Tsantanis is the Chairman and CEO of Seanergy Maritime Holdings (NASDAQ:SHIP). He has more than 19 years of experience in senior shipping and finance positions. Stamatis joined Seanergy in 2012 and led its reorganization and significant fleet growth into a prominent Capesize drybulk company of more than 1.7 million dwt. Prior to joining Seanergy, he served as Group CFO of Target Marine and managed its corporate and financial strategy. Stamatis previously served as the Chief Financial Officer and Director of Top Ships Inc. from its initial listing on NASDAQ to its growth as a major tanker owner of a fleet of 2.5 million dwt. Prior to that, he was an investment banker at Alpha Finance, a member of the Alpha Bank Group, with active role in a number of major shipping corporate finance transactions in the US capital markets. Stamatis is a fellow of the Institute of Chartered Shipbrokers and holds a Master's degree in Shipping Trade and Finance from Cass Business School in London and a Bachelor's degree in Shipping Economics from the University of Piraeus.